Illumine is a roguelike. However, illumine's world is not a static procedurally generated place. In illumine the player interacts with the environment, triggering its dynamical transformation. Each situation then becomes a self-contained puzzle, which the player can approach from any angle and deal with however he wants, whether by stealth or by manipulating the AI. Not all inhatants of this world are friendly. In order to progress, the player will not only have to keep his eyes open but he will also have to listen closely to his surroundings. As the soundtrack is generated in real-time by the various AI and gameplay elements in the player's vicinity, any change in the music will inform him of the dangers that might be lurking in the dark. The main character will eventually overcome these hurdles, if not in this life, then in a future reincarnation. As past lives will affect his future, how the main character interacts with others will shape his experience. It will ultimately be up to the player to find his purpose, be it his own personal development or others' well-being. illumine is available now for Windows and Linux. 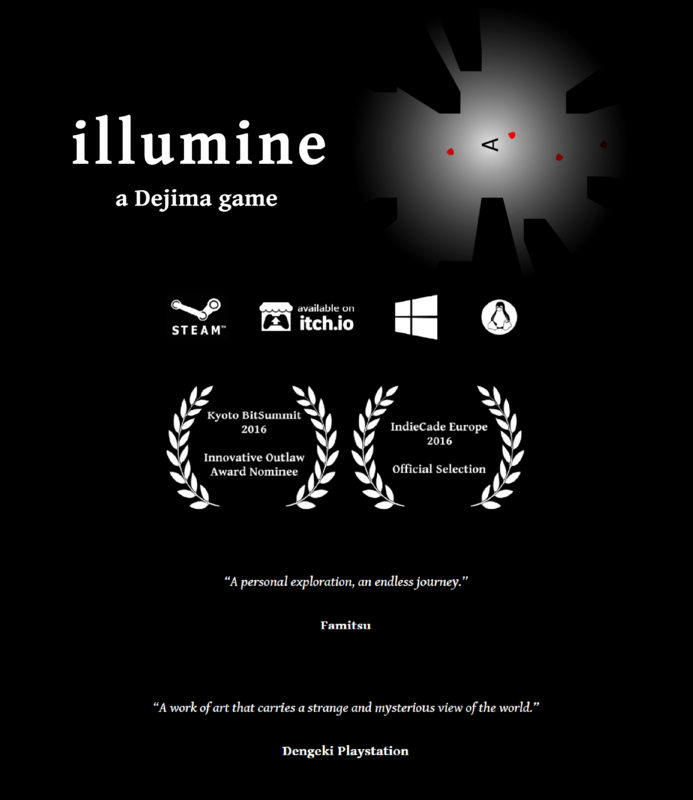 illumine is available on Steam for Windows and Linux. illumine is a non-violent roguelike with a different twist on procedural generation and a gameplay-driven soundtrack. The game was nominated for the Innovative Outlaw Award at this year's Bitsummit in Kyoto and is part of the Indiecade Europe official selection. illumine is now on Steam Greenlight, vote now to help us bring our strange roguelike to steam! A few thoughts about illumine's presence at BitSummit, Kyoto's indie festival. Accolades, mistakes and lessons learned.